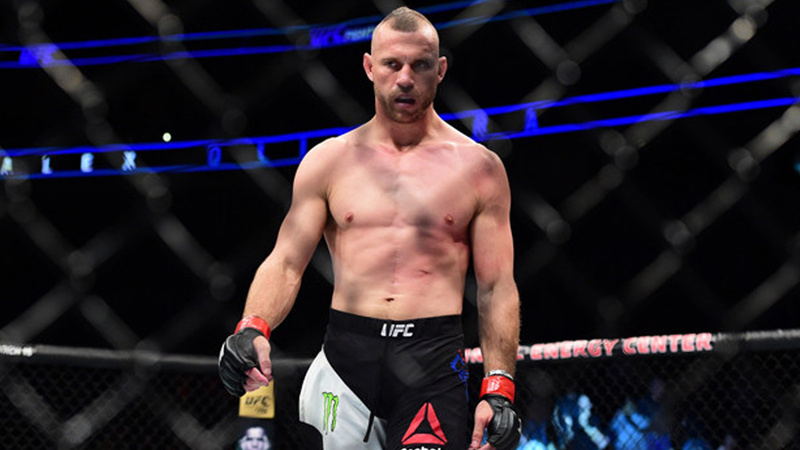 Donald Cerrone is a former Ring Of Fire Lightweight champion, a former three-time WEC Lightweight division runner-up, and a former UFC Lightweight division runner-up. Donald Cerrone is currently 36 years old according to his date of birth March 29, 1983. Donald Cerrone entered the world of mixed martial arts as an undefeated kickboxer. He is equally good in the stand-up and ground game. His trademarks are long-range left uppercut to the face and body, right high kick, long range low kicks, high kicks… but the Cowboy almost never miss his super fast right cross. He is one of the tallest fighters in the division who uses reach advantage very effectively. The Cowboy usually steps back and counters his opponents. In the clinch, he tries to control the opponent’s head and land the knee or an elbow to the face. He rarely shoots in but when he does it is mostly a double leg takedown attempt. Cerrone has good takedown defense but sometimes he intentionally lets the opponent take him down. Donald Cerrone is a black belt in BJJ and a black belt in Gaidojutsu, so his ground game is outstanding. Cowboy lands the flurry of hooks on the downed opponent, but he is the most dangerous when he mounts the opponent’s back. His favorite submissions are rear-naked choke (5 victories), triangle choke (8 victories), and armbar (3 victories). Most Performance Of The Night bonuses – 2nd place (shares with 6 fighters) – 4. Cerrone had his MMA debut versus Nate Mohr at Ring Of Fire 21: Full Blast, whom he defeated in the first round via triangle choke. He earned the score of 13-3, 1 NC, before joining UFC. His fight with Kenneth Alexander at WEC 30 was overturned to no contest when The Cowboy tested positive for a banned diuretic. The Cowboy was defeated two times by Benson Henderson in two WEC title fights. Their first fight at WEC 43 on October 10, 2009, was won by Henderson via unanimous decision, and it was voted Fight Of The Year 2009 according to Sherdog. In their second fight at WEC 48 on April 24, 2010, Henderson won easily via first-round guillotine choke. The Cowboy had his UFC debut versus Paul Kelly on February 5, 2011, at UFC 126, and won the fight via rear-naked choke, earning his first Fight Of The Night award. Cerrone defeated Vagner Rocha on June 11, 2011 at UFC 131 via unanimous decision. The Cowboy was very dominant against Charles Oliveira at UFC on Versus 5, on August 14, 2011, winning the fight via first-round TKO, earning his first Knockout Of The Night award. Donald Cerrone defeated German Taekwondo master Dennis Siver on October 29, 2011, at UFC 137, via first-round rear naked choke, earning his first Submission Of The Night award. 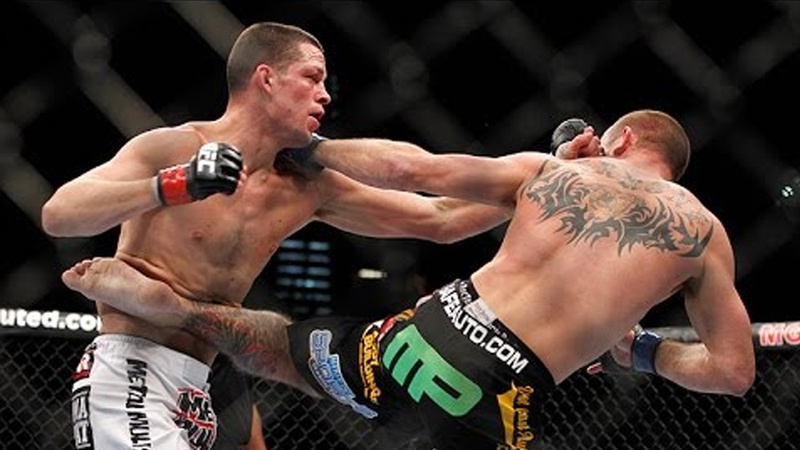 Cerrone fought legendary trash-talker Nate Diaz at UFC 141 on December 30, 2011. Cerrone knocked Diaz down multiple times with amazing low kicks but his punches weren’t precise. Diaz landed 82% of his strikes and won the fight via unanimous decision. Cowboy was missing with his combos heavily and confessed that he had wrong tactics since he got angry and wanted to kill Nate. This fight holds the record for the most significant strikes landed ever in a three-round fight – 238. Both fighters received Fight Of The Night bonuses. Cerrone successfully defeated Jeremy Stephens on May 15, 2012, at UFC on Fuel TV 3 via unanimous decision. The Cowboy knocked Melvin Guillard out via spectacular left high kick followed by a right cross on August 11, 2012, at UFC 150, winning his second Knockout of the Night and third Fight of the Night award. Guillard also missed weight and had to give 20% of his purse to Cerrone. It was the fastest victory of Donald’s career – he finished the opponent after only 1:16 in the first round! Anthony Pettis defeated Cowboy on January 26, 2013, at UFC on Fox 6, via left body kick TKO. The UFC legend next faced K.J. Noons on May 25, 2013, at UFC 160, whom he defeated via unanimous decision. Rafael dos Anjos defeated Donald Cerrone at UFC Fight Night 27, on August 28, 2013, via unanimous decision. Cowboy then earned a victory over Evan Dunham on November 16, 2013, at UFC 167 via tremendous second-round triangle choke, earning his second Submission Of The Night award. His next opponent was Adriano Martins on January 25, 2014, at UFC on Fox 10, whom he spectacularly defeated via head kick KO, earning his third Knockout Of The Night award. On April 19, 2014, at UFC on Fox 11, Donald Cerrone defeated the tremendous Brazilian kicker, Edson Barboza, via first-round rear-naked choke, and earned his first Performance Of The Night award. Despite being an underdog, Cowboy defeated Jim Miller on July 16, 2014, at the main event of UFC Fight Night 45, via amazing right high kick KO, earning his second Performance Of The Night award. His next opponent was Eddie Alvarez at the co-main event of UFC 178, on September 27, 2014. Donald won via unanimous decision. Cowboy then defeated Myles Jury on January 3, 2015, at UFC 182, via unanimous decision. The Cowboy fought for the second time in 15 days in the third match versus his old WEC rival and a friend Benson Henderson at UFC Fight Night 59, on January 18, 2015. This time, Donald Cerrone was very cautious and fought off distance, not letting Henderson land too many punches. Henderson hit many oblique kicks to the body, but Cerrone won via unanimous decision, however, 12 of 14 media outlets scored it in the favor of Henderson. On May 23, 2015, at UFC 187, Cowboy defeated John Makdessi, who surrendered after receiving a left high kick to the eye. Rafael dos Anjos defeated him at the main event of UFC On Fox 17, on December 19, 2015, via TKO (body kick and punches). It was the fastest defeat in the history of Lightweight division title fight – the fight lasted only 66 seconds. Donald Cerrone started competing in Welterweight division after this defeat. Cerrone won Alex Oliveira on February 21, 2016, at the main event of UFC Fight Night 83, via triangle choke in the first round, and was rewarded with one more Performance Of The Night bonus. The Cowboy earned another Performance Of The Night award after TKO victory over Patrick Cote on June 18, 2016, at UFC Fight Night 89. Donald Cerrone earned his third consecutive Performance Of The Night award after his win over Rick Story on August 20, 2016, at UFC 202. At UFC 206, on December 10, 2016, Cerrone sent Matt Brown to sleep via superb third-round right high kick KO. The two fought at on January 28, 2017, in the co-main event at UFC on Fox 23. Jorge Masvidal won via TKO. But at the end of the first round, Masvidal dropped Cerrone few seconds before the end of round one and Herb Dean stepped in before the bell and didn’t let him finish the fight! Many fans were booing thinking it was a knockout. However, Masvidal ended the job in the second round. The two should face at UFC 205 but Robbie Lawler turned the fight down. 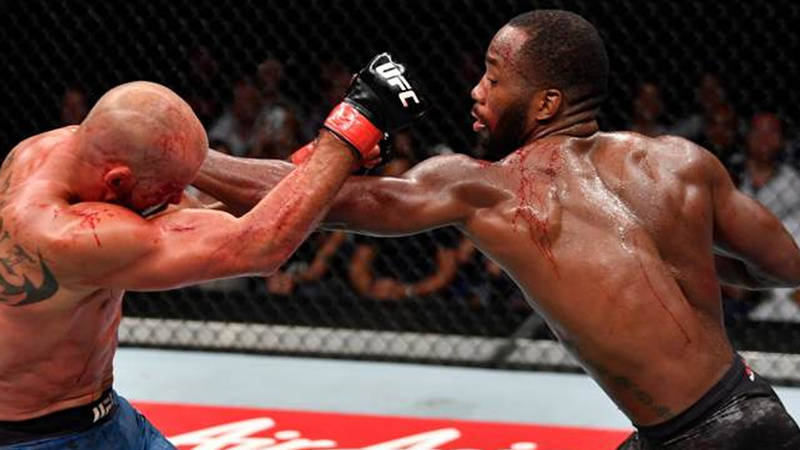 It was then scheduled for UFC 213, but it was later published that Cerrone suffered a groin injury and a staph infection, and the fight was rescheduled for UFC 214 on July 29, 2017. Robbie Lawler outpointed Cowboy and won via unanimous decision in a technical-tactical match. Darren Till defeated Donald Cerrone at the main event of UFC Fight Night 118, on October 21, 2017. Despite Cerrone knocked him down on multiple occasions, Till won via first-round TKO. 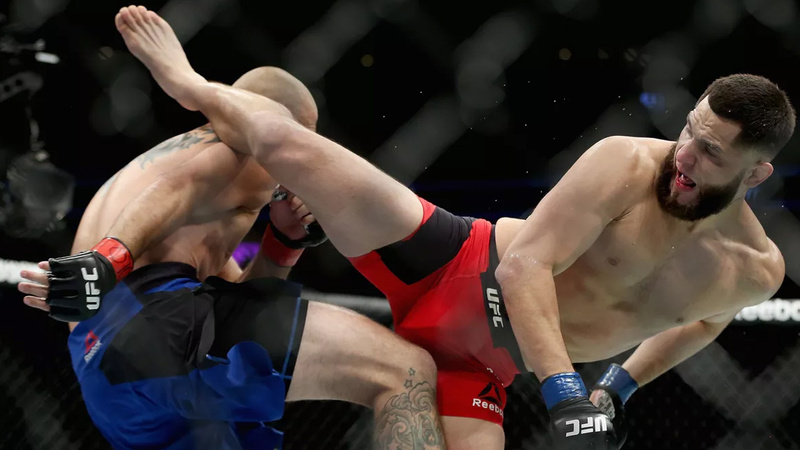 Donald Cerrone had a very easy job versus Yancy Medeiros, whom he defeated via TKO on February 18, 2018, at the main event of UFC Fight Night 126. The Cowboy is defeated to Leon Edwards at the main event of UFC Fight Night 132, on June 23, 2018. UFC officials offered Cowboy to fight as a replacement for injured Yancy Medeiros versus Mike Perry, but his coach declined it and he was replaced by Paul Felder. Donald Cerrone has a fiancee, Lindsay Sheffield. Their son was born on June 29, 2018.